New polls show Trudeau's honeymoon continues to roll on and suggest that Tom Mulcair has competition from the prime minister even among his own base. Eric Grenier looks at the numbers. Two new polls suggest that Prime Minister Justin Trudeau continues to enjoy high approval ratings in the early days of his government, that Canadians are split and largely undecided on the performance of interim Conservative leader Rona Ambrose and that Tom Mulcair is not much more popular among his party's own supporters than Trudeau is. The polls were conducted by Forum Research for the Toronto Star and EKOS Research for iPolitics. They show Trudeau having an approval rating of 57 and 64 per cent, respectively, with disapproval standing at 30 and 27 per cent. Trudeau's approval ratings were particularly good in Atlantic Canada, British Columbia and Quebec, while Canadians in the Prairies and Alberta had a more mixed view of the Liberal leader. This is an improvement over where he stood in the final days of the 2015 federal election campaign, with his approval rating up about eight points and his disapproval rating down about seven points in Forum's polling. Not surprisingly, Trudeau has a sky-high approval rating among Liberal voters. Forum suggests that 90 per cent of Liberals approve of Trudeau's performance, with just 3 per cent disapproving. According to EKOS, his approval rating among Liberals stands at 98 per cent. Neither Ambrose nor Mulcair boast anything close to those numbers among their party's own supporters. Among all Canadians, Ambrose had an approval rating of between 26 and 32 per cent, with her disapproval rating standing at 27 to 32 per cent. That left about one-third to one-half of Canadians saying they did not have an opinion on the performance of the Conservative leader, who was only installed in her current role in the first week of November. As one might expect for an Alberta MP, Ambrose had her best numbers in her home province. Her approval rating across the two polls was lowest in Quebec. That Ambrose showed virtually even numbers of Canadians approving and disapproving of her is actually a marked improvement for the leader of the Conservative Party. At the tail end of the campaign, Stephen Harper had about twice as many Canadians disapproving of him as approving of his performance. Ambrose's approval rating among Conservative voters differed greatly between the two polls. Forum pegged her approval rating among Conservatives at 47 per cent, with 13 per cent disapproving. EKOS, on the other hand, put her approval rating at 71 per cent, with just 6 per cent disapproving. Tom Mulcair's approval rating has slid since the end of the election campaign. At the time, Forum estimated his approval rating to be about 50 per cent. The latest poll puts it now at 41 per cent, with 31 per cent disapproving. EKOS, which had Mulcair's approval rating standing at 53 per cent at the mid-point of the campaign, now puts it at 46 per cent, with 31 per cent disapproving. Only in Quebec did both polls show a significantly higher level of support for the NDP leader. Problematic for the New Democrats, however, is how Mulcair stacks up against Trudeau among NDP voters. Forum and EKOS put Trudeau's approval rating among New Democrats at between 67 and 72 per cent, with just 15 per cent standing in disapproval. By comparison, Mulcair scored a 71 to 77 per cent approval rating among New Democrats, with his disapproval rating sitting at 14 to 18 per cent. Conservatives had no such split personality: 78 to 84 per cent of them said they disapproved of Trudeau. This has the potential to be very dangerous for the New Democrats, who are searching for a role within the new political landscape. Putting aside how people who say they would vote NDP today see the Liberal prime minister, the New Democrats already seem to have lost support to their centrist rivals. 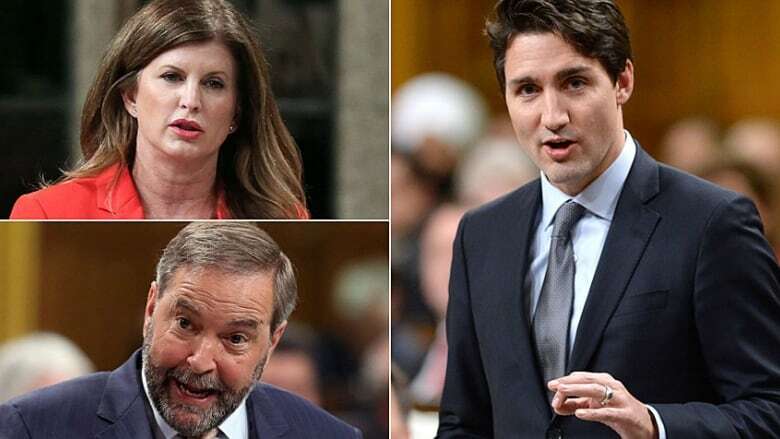 The two polls pegged the NDP to be at 13 to 15 per cent support in voting intentions, a drop of five to seven points that seems to have largely gone to the Liberals, who stood at 46 per cent, up six points since the election, in both polls. On their own, these numbers are not particularly worrying for Mulcair. His approval ratings among New Democrats were not dissimilar when the NDP was leading in the polls earlier in the year. But Trudeau, at the time, had nowhere near the support levels he currently enjoys among New Democrats — and that was when the NDP was polling about 20 points higher than where they are today. The issue for Mulcair as he tries to hold onto the leadership of his party is not that New Democrats dislike him — they don't. It is that he can't claim their affections to be any greater for him than the man he is supposed to be criticizing and holding to account on their behalf. The poll by Forum Research was conducted for the Toronto Star between Dec. 6 and 8, 2015, interviewing 1,369 people via interactive voice response. The margin of error associated with the poll is +/- 3 percentage points, 19 times out of 20. The poll by EKOS Research as conducted for iPolitics between Dec. 7 and 10, 2015, interviewing 1,956 Canadians via the internet and the telephone. As the poll was primarily conducted online, a margin of error does not apply.